Today, Honda Atlas Cars Pakistan Limited (HACPL) launched its Civic 2019 – 10th generation car in an event held at Royal Palm, Lahore. The facelift model of Honda Civic has been anticipated in Pakistan since quite a while. The auto manufacturer further confirmed the news with its social media campaign named “Better Buckle Up”. Honda Atlas is currently manufacturing the 10th generation of Honda Civic in Pakistan which was introduced back in July 2016. Ever since its launch, it has been very popular in the local auto industry and car enthusiasts. The 10th generation Honda Civic is now almost 3 year old which is now introducing a facelift model, much-anticipated move in the market. Following the values that created the identity of the Honda Civic, Honda Atlas officially introduces the 2019 Honda Civic with changes in exterior and interior design, bringing out a new look that emphasizes on the youthful, dynamic personality and strong breakthrough in each detail, to meet the demand of more customers who love sporty cars. This variant will get the most out of Honda’s Better Buckle Up teaser. The facelift model of Civic Oriel will now feature LED headlights with DRL which is a welcome addition to the car. Besides, this variant will also be equipped with 16 inches Alloy wheels with a new rim design and LED fog lights. The front and rear bumper of the 1.8-litre sedan will be equiped with the addition of a chrome strip. Furthermore, there will be an addition of LED fog lamps on bumper with chrome. Honda’s infamous shark fin antenna will also be featured in the facelift model of Civic. This variant currently comes at a price tag of Rs.3.399 million (ex-factory). The base model of Honda Civic is already equipped with a 1.8-litre i-VTEC engine mated with CVT transmission. The facelift model will get the only addition of “Cruise Control” to the luxury car which is already present in its high-end Oriel variant. There is no other noteable change is made in the facelift model of the car. It will come with a price tag of Rs.3.199 million (ex-factory). Honda Civic launched its Turbo variant along with other 10th generation models of in 2016. 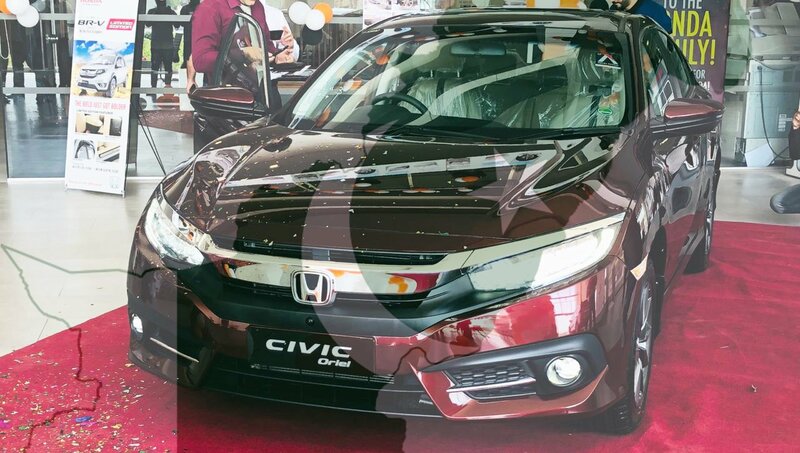 It was a milestone achievement as Honda Civic Turbo was the first locally assembled turbocharged engine in Pakistan. However, the Turbo variant production was halted a few months after the launch due to complaints about engine knocking by the consumers. Honda Atlas blamed it on poor petrol quality. • LED Headlights with DRL. • 17 inches’ alloy wheels as compared to 16 inches in other variants. • LED Fog lamps on bumper. • Trunk Spoiler with LED. • Trunk lining with hinge covers. • Dual engine exhaust pipe (as before). • Paddle Shifters (as before). • Upgraded 7” infotainment system with navigation with Rear entertainment system. • RS Emblem on front and back. This variant currently comes at a price tag of Rs.3.799 million (ex-factory). Honda Civic has become one of the sedans leading C-segment, being trusted and favored by a large volume of customers. In particular, Honda Civic has made a record sale of 50,000 units and won “Car of The Year” By People’s Choice Award in 2017 and 2018. The impressive milestones are the evidence for the appeal of outstanding values: the top-class breakthrough design, powerful engine offering fun-to-drive performance and excellent fuel efficiency with series of modern and advanced technologies. Mr. Hironobu Yoshimura, President & CEO of Honda Atlas Cars (Pakistan) Ltd., mentioned at the launch, “Honda Civic has been a household name since its introduction into Pakistan in 1994. The Honda Civic 1.5L RS Turbo has set a new benchmark with its innovative features and futuristic design. Honda Civic RS Turbo will surely leave a lasting impression on the automobile industry of Pakistan”. The 10th generation Civic 2019 will be displayed and sold at 27 Honda authorized 3S dealers nationwide from today. Moreover, the booking of all variants will open today. Next articleJW Forland, A game changer? I like to cover tech-happenings, startups, automobile industry and economy trends in Pakistan.